MOSCOW, Russia -- OAO Gazprom and NAK Naftogaz Ukrainy agreed to start valuing assets for a possible joint venture, as the Russian gas-export monopoly bets against an international group to manage Ukraine’s pipelines. 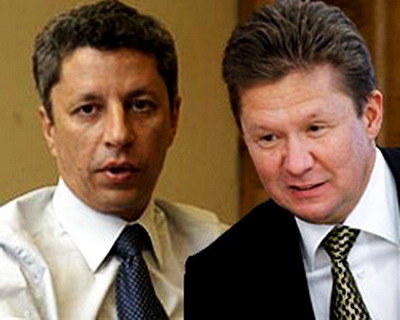 Gazprom Chief Executive Officer Alexei Miller (R) and Ukraine’s Fuel and Energy Minister Yuriy Boyko. Gazprom Chief Executive Officer Alexei Miller met with Ukraine’s Fuel and Energy Minister Yuriy Boyko in Moscow today to discuss the planned venture, the gas producer said in an e- mailed statement. Russian Prime Minister Vladimir Putin had offered to merge Gazprom with Naftogaz in April. State-run Naftogaz transports about 80 percent of Russia’s Europe-bound gas exports via its Soviet-era transportation network and Russia has sought control over it. Naftogaz may contribute the pipeline in the joint venture while Gazprom would offer the Ukrainian company access to producing fields in Russia. Ukraine has sought to set up an international group with partners from the European Union and Russia to manage and upgrade the gas pipeline network.